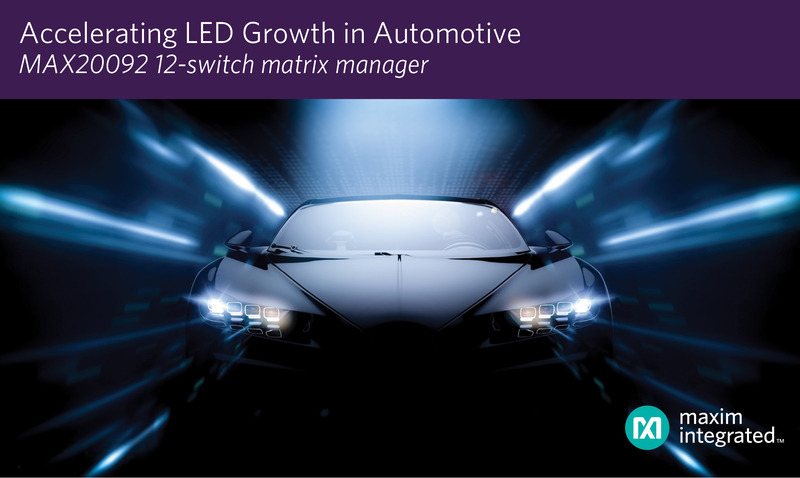 MUNICH, Germany – October 10, 2018 – Designers of high-performance automotive matrix lighting and adaptive driving beam light-emitting diode (LED) applications can now migrate to higher current devices while reducing solution size and improving flexibility with the MAX20092 12-switch matrix manager from Maxim Integrated Products, Inc. (NASDAQ: MXIM). The IC minimizes thermal issues associated with LED matrix lighting applications by offering the industry’s lowest internal switch resistance (RDS_ON), which is 65 percent lower than the closest competitive solution. Safety and brand differentiation are two of the leading factors driving greater adoption of LEDs in automotive front-lighting platforms, which are growing at 30 percent per year, according to Strategy Analytics, Inc. As part of their distinctive brand identities, OEMs are designing in advanced safety features such as glare-free high beams along with LED and matrix lighting. However, LED lighting designers are challenged with increasing power, thermal and design complexities. The MAX20092 provides flexible current management for matrix and pixel lighting. Twelve integrated switches control LEDs in string voltages up to 56V, saving design time and reducing complexity. Its integrated MOSFET on resistance (RDS_ON) of 70 mOhm is the lowest in the industry – comfortably driving LED currents up to 1.5A. Maxim’s 12-switch LED matrix manager is offered in a small 5mm x 5mm TQFN package. Additionally, Maxim today introduced MAX20096 and MAX20097 dual-channel, synchronous buck high-brightness LED controllers to work with the MAX20092, helping designers improve transient response times in LED lighting. The MAX20096 and MAX20097 deliver ultra-fast transient response with near-fixed frequency with Maxim’s proprietary average current mode control scheme, minimizing EMI and enabling a reliable, high-performing design. Integration: Reduces bill of materials (BOM) costs while saving space. Manages one to two LEDs per switch with 12-bit pulse-width modulation (PWM) dimming. Provides built-in logarithmic fade-in/fade-out capability that simplifies LED programmability and reduces taxation on system bus lines. High Performance and Safety: Low RDS_ON of 70 mOhm safely enables LED current of up to 1.5A. Features advanced fault protection and management for open, short and open-trace LED detection. Flexibility: Can parallel up to 27 MAX20092 devices without daisy-chaining to manage large LED pixel count of up to 324 LEDs; allows designers to configure 1 string x 12 series switches, 2 strings x 6 series switches, and 4 strings x 3 series switches from each IC. Electromagnetic Interference (EMI) Mitigation: Slew-rate control reduces EMI and noise. The MAX20092 is available at Maxim’s website for $2.93 (1000-up, FOB USA). The MAX20092EVSYS evaluation kit includes a graphical user interface, matrix manager board and an LED adapter board featuring Osram Opto Semiconductors’ Oslon Compact PL, KW CELNM1.TG, LED components, which are suitable for adaptive matrix-style headlights. Visit Maxim at electronica 2018 in Munich, Germany, from November 13-16, 2018 in Hall C4, Stand 440. More information is available under https://www.maximintegrated.com/en/aboutus/events/electronica-2018.html .